Description: Late day power shot. Description: D&H C420 #408 (ex-LV) at Oneonta yd. Description: Always alot of power here! They were leasing 2 CR GP38s at the time. Description: On the ready tracks. 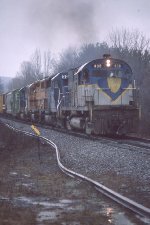 Description: A WB D&H train arrives in Binghamton. 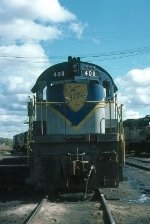 Description: Gilford/D&H Operations - Conklin Yard in Conklin, NY. Title: Gilford/D&H Operations - Bevier Street Yard in Binghamton, NY. 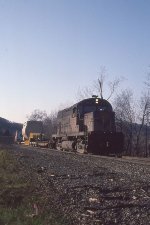 Description: Gilford/D&H Operations - Bevier Street Yard in Binghamton, NY. Description: "Popeye's" U25-B is about to roll over the hot box detector at Lake Pleasant. Description: Before I realized how important it can be to note time and place, I snapped off photos without thinking about it. To the best of my recollection this photo is from a town east, northeast, or southeast of Watertown, NY in the fall of 1996 or 1997. (date and place are approximated)*********From this point on, I have updated the text. Many thanks to Matt Giardino for helping me recollect a trip back to my home turf from Tupper Lake back in 1997! I will be changing the photo location from Carthage to Otter Lake, and the date from 1996 to 1997. However, the exact date is still "up in the air"; but I'm pretty sure it was a Sunday!